Trying to find the correct namecard displays for attracting customers? 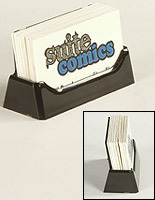 These best selling business card holders are the most popular card fixtures selected by our clients. Whether based on design, color, price, or functionality, these placards reflect the best we have to offer. The above selection provides a decent overview of these desktop office supplies. 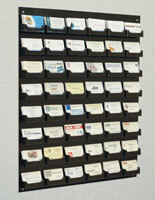 These business card holders, also known as credential racks, range from single pocket units to offerings with numerous enclosures - or a combination of both. The collection is continually changing based on changing tastes in the current market, so check back frequently to track the newest trends. These business card holders come in both deluxe and economic models, with single and multiple pockets or in combination pocket styles. There is certainly a top seller that will fit into the budget. 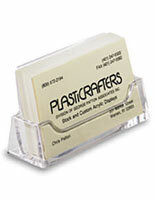 These business card holders are the tools that make it easy for customers to take contact information with them. All of the models are perfect for disseminating name cards in a viable and intuitive manner. These business card holders are the invitations that customers need to "take one". 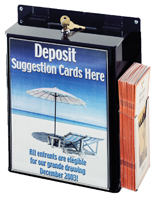 Passersby will recognize these top selling contact card racks instantly, collect the information, and keep it for future use. These business card holders, also known as best sellers, represent the models that people are selecting the most right now. 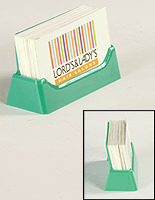 BusinessCardHolders2Go.com sells many styles of commercial information collectors, dispensers, and cases to firms, office executives, libraries, and service providers. 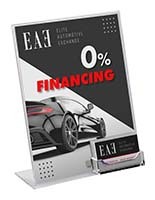 These calling displays for sale are typically placed on service counters, near cash registers, in waiting rooms, and in lobby waiting rooms. 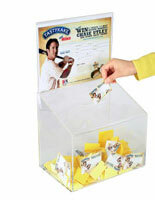 How are namecard fixtures best used to link consumers with professionals and organizations? 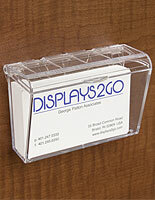 At the end of the day, best selling business card holders are all about the consumer. These models are used to present the information vital to making sales and assisting customers. The store fixtures have the name, company, phone number, e-mail address, and other details in a logical and organized place. Customers will have an easier time pulling the cards from the racks. Single & multiple pockets provide some of our store fixtures with a way to dispense both contacts and trifolds as well as signage via additional pockets and sign headers. 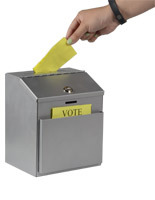 These credential cards are offered at economic and deluxe price points card with single and multiple and combination pockets as well as ballot bin styles in plastic or metal. 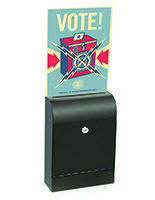 These dispensing displays can be found in many large office buildings with lots of tenants. 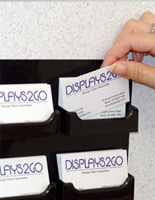 Placing acrylic name card racks in a central location can advertise all of the businesses located within the complex, plus the contents can be seen so their purpose is instantly visible. Each style in our bestsellers collection is slightly different, so advertisers should appraise their space when working in store fixtures. Sometimes it is more viable to place periodical racks on the wall than on counters, or vice versa. Take on the innovative supply that best works for the setting. 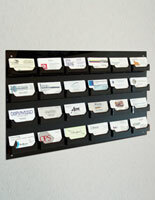 What types of materials are used in the construction of these name card racks? Most of the the models in this selection are acrylic lead cards units include plastic in some fashion or another. This material takes many forms, including acrylic, PMMA, ABS, Polycarbonate, and others. 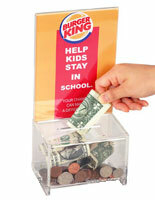 The plastic used is very durable and will stand up over constant use. Also, literature racks crafted out of this material often come at a low price. Metal, more specifically aluminum, is a frequent choice among customers. The material makes for a more modern appearance. Color finishing is capable of making the unit really noticeable in certain situations. The aluminum is sturdy enough to function well over time. The material also coordinates well with many settings. Wood accents coordinate with counters and tables. These display fixtures have wooden bases and sides in great finishes. Oak, mahogany, and other name card holders are available. 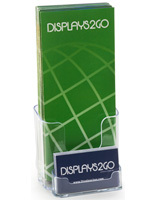 Desktop publication racks and holders are popular in most settings in myriad materials. 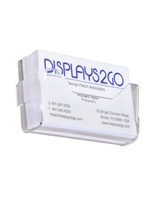 Used for promotional promoting or simply as a tool to help organize the office, business card accessories are designed to display business cards in a professional setting. Your clients will be free to take a card, reforming your visibility within the community! 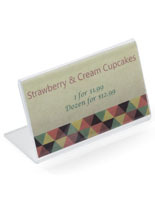 Browse our online commodity line for more business card displays, on sale now! Look for desktop, wall mount, and combination and multiple pocket models. 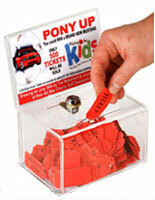 Advertisers should also browse through the line of drop boxes. 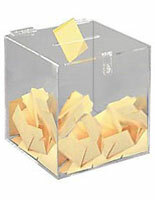 These promotional containers are the perfect place for comment cards, collecting contacts , or accepting ballots. Retail stores, restaurants, offices, and many other associations regularly install these models to fulfill many functions. 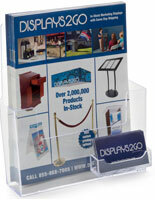 There are large and small containers and brochure racks for the different situations. 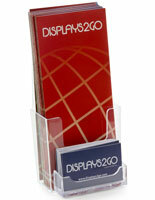 Wall mounted literature displays are available as well. Peruse each category to make the best possible choice! 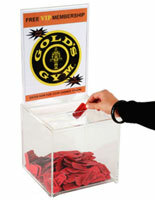 BrochureHolders2Go.com is known throughout the world as one of the leading namecard display fabricators and suppliers. The vast collection includes many different units for desk tops, counters, walls, and many other locations. 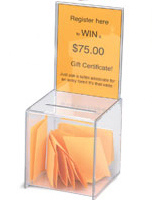 Maximize the next advertising campaign or simply have a more effective way to pass out cards. 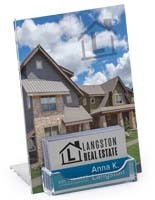 Some models even include areas for supplemental advertisements, such as printed images and flyers. 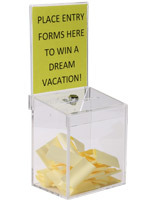 Drop boxes for testimonials go far to encourage customers to provide feedback on businesses so they can improve. No matter which style is chosen, for what need, the racks and at this online store dispense and display professional literature in style and at an appealing price point.